Friends! I have post for you today written by Dave! 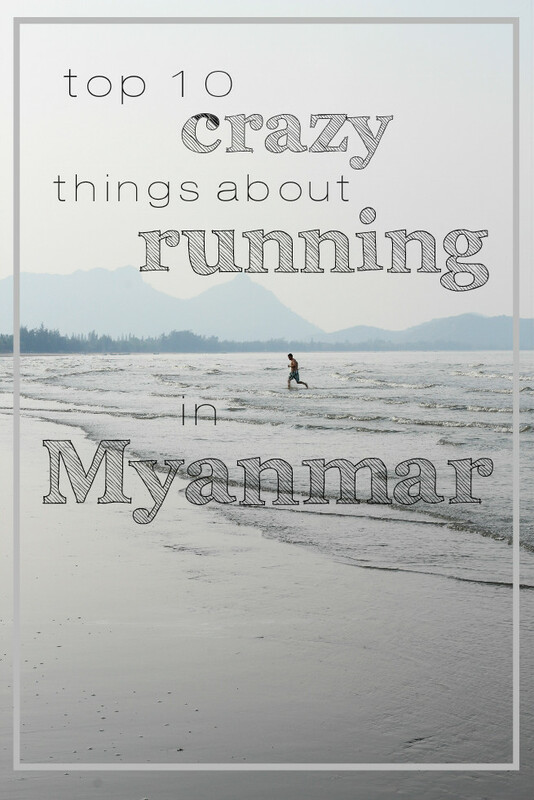 This was all his idea too and he came and said "I have a blog post for you about running in Myanmar." I think it is really fun that he joins me in my blogging adventures and I cracked up at this post because it is just so #LifeinMyanmar. I'm proud of Dave for being disciplined. He is really good at being consistent and the fact that he has ran all this year in Myanmar is a huge deal! Running is a whole new kind of hard here so I'm really proud of him. 1. Since it can get up to around 120 degrees Fahrenheit, Any temperature below 95 is ideal and a relatively comfortable temperature to run in. 2. 99% of the time you will be the only one running. In the last year I have seen less then 10 people besides me running. The vast majority of people will stare. It's rare to see someone running. 3. At least once every run some joker will point at you and imitate running. Usually it is a guy with bright orange hair and a dress, well actually it's called a longyi (man skirt) but the guy running is the odd one in this country. 4. Even if you have to cross the street to be in the shade it's worth it. 5. Wearing sunglasses will protect your eyes: not only from sun but more importantly, from being poked by people's umbrellas which they use rain or shine. My sunglasses have prevented at least 3 eye injuries that I can think of. 6. It's always more than just running - dodging thousands of people, dogs, bikes, cars and buses along with, jumping over random massive holes in the sidewalk and trash piles. 7. There's never a good time to run. Early mornings might work but I could never wake up in time to know. Later Mornings after 8 are crowded and busy but a little cooler, midday is ridiculously hot and sunny but not usually too crowded, night is cool and sometimes uncrowded except near shopping areas but it's far too dangerous because you can't tell where all the holes in the sidewalks are, or where the extremely uneven areas are. Some sidewalk holes go down 6 ft or more into the sewer...The sidewalk literally could swallow you whole and you could be in 💩 <-- (That's the pile of poop emoticon that won't translate over into blogger) over your head. I still run at night on routes I know though. 8. Taxis will drive up next to you honk and ask if you need a ride. They just think you are in a hurry and don't understand that you're trying to exercise. 9. If nature calls during the middle of a run it's acceptable (for men at least) to just go to the side of the street and relieve yourself. I admit I've done this a few times. Don't judge! there's so few public bathrooms it's not as if there's a choice at times. Most men here will hike up there longyi (man skirt) and squat mere inches from the ground to be more discreet. I physically can't squat like they do nor can I wear a longyi for more than 30 minutes before the law of gravity overcomes my inability to properly wrap a longyi. 10. Most days you can run 3 or 4 miles about 15 minutes faster than a taxi can drive 3-4 miles! That's how terrible the traffic is in Yangon. For a while we only had 1 set of apartment keys. Beka would take a taxi while I would run home and often to my frustration I beat her home and would have to wait in the heat for the taxi to inch it's way towards the apartment. And there you have it friends! I loved reading this list from Dave. Do you have any questions for him? He'll be happy to answer in the comments. Where is the craziest place you have run?